Interstate 45 near Corsicana reopened Sunday morning after being closed due flooding on the highway. A powerful storm system rumbled through Texas Friday and Saturday, dumping 20 inches of rain on Corsicana and leaving a large portion of the area under flash flood watches through Sunday or Monday. It seemed everywhere you turned in Navarro County, a barricade blocked you from continuing on toward a flooded road. Texas DPS Troopers closed about 35 miles of Interstate 45 from Alma to Streetman in Navarro County overnight Friday and into Sunday. Some drivers, like Jorge Guerrero, weren't expecting such a major delay. "We're probably just going to hang out here for another hour or so, see if they open it back up," said Guerrero. Chopper 5 flew over Navarro County after torrential rains left widespread flooding. He and his family had been trying to drive to Mexia since Saturday afternoon. They searched for any route in Navarro County which was not covered by water, hoping I-45 would be open Saturday evening. However, the State Troopers blocking each and every entrance ramp held steady with warnings of dangerous driving conditions. Lezlee Pinkerton and her husband intended to head to Houston to pick up their daughter. They quickly found themselves being rerouted back north because of high water. "She's just down there with her friends and we were supposed to be down there and back up here by 10:30 tonight," Lezlee said. "Doesn't look like we're gonna make it." TxDOT detours were put in place: Northbound U.S. 84 in Fairfield, west to Texas 171 in Mexia, north to I-35E. Local traffic turnaround at Farm-to-Market Road 1394 in Richland. Southbound I-35E to Texas 171, Hillsboro to Mexia, then eastbound U.S. 84 to I-45 Fairfield. Local SB cars turn around at Ellis County line. For Dallas, much of the rain had let up Saturday afternoon, though isolated showers were forecast to move in through North Texas overnight. 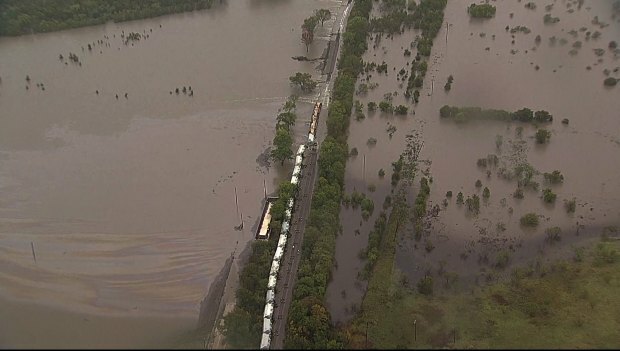 Also in Corsicana, a Union Pacific train overturned and was partially submerged after the tracks were washed away by high water. The Navarro County Emergency Management Office said high water rescue teams were gearing up shortly before 6 a.m. to rescue two people from the train. Meanwhile, the Houston area has had some flooding issues as well. NBC's Charles Hadlock shows the flooding left behind in Houston. 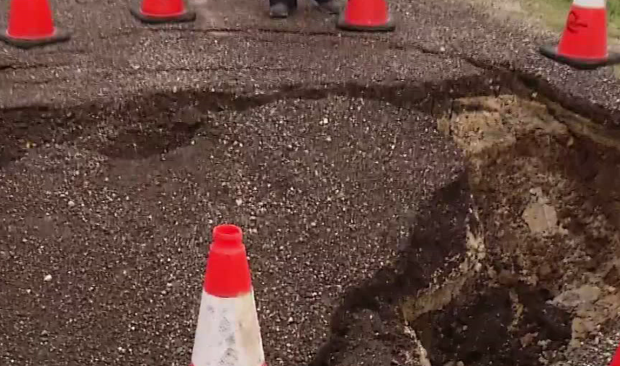 Cleburne had an issue of their own that resulted in one of their side roads creating a huge pothole that was about 8 foot deep and 10 feet wide. What started out as a minor pothole worked its way up to being 8 foot deep and 10 feet wide on a side street in Cleburne.